ely’s Big Tasting will be held on March 21st in ely bar & brasserie IFSC, and, as ever promises to be a fantastic evening of tasting. There will be more than 100 wines from 15 countries, including classics from the old world, modern classics from the new, not to mention Champagnes, Ports, sherries and dessert wines. We will feature artisan beers, Irish Ciders, organic beef from our family farm and much more…..
ely loyalty card holders are entitled to a special rate for up to 8 tickets. Quote your card number or full name. Eating in a trendy, casual city-centre restaurant recently I came across a modest French wine for €30. I happen to know the producer in France receives €1.85 for the same wine. The importer probably takes around €1.50-€1.70, the Government a generous €8.80, leaving €18 for the restaurant. Seems a lot for opening a bottle of wine? 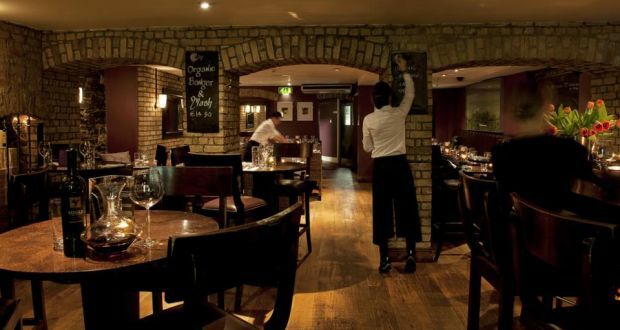 High margins may be justified in the case of Michelin-starred restaurants that have huge overheads, a cellar of maturing wine and a team of qualified sommeliers. But a well-run bistro can turn over its stock of wine several times before paying for it, and the staff often don’t have any wine knowledge at all. Arguably the real culprit is the Minister for Finance. Restaurant mark-ups here are roughly the same as in France and the UK (around 70 per cent), but our base costs are much higher. In France, a very decent €4 bottle of wine would cost €16 in a restaurant. The same bottle in Ireland would cost the restaurant around €9 from a wholesaler and €37 on their list. 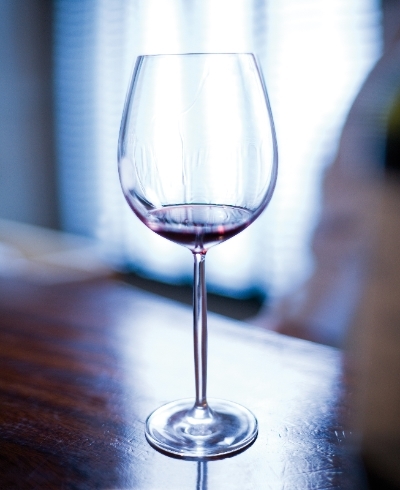 Recent increases in duty mean a wine that once sold for €25 in a restaurant is now over €30. I am familiar with the arguments put forward by restaurateurs; they have very high overheads. Some have cut their food margins (traditionally the same as wine) to appear good value and then increased wine prices. A teetotaller may get great value, but as a wine lover I find it difficult to pay €45 or more for a bottle of wine that is available for €15 in my local wine shop. Many hotels and restaurants deliberately try to source “restaurant exclusive” wines that customers will not be able to compare. But punters are not stupid and tend to opt for the least expensive wine on the list. Establishments then find that they can only sell the less profitable house wines and are forced to increase their prices still further. Dublin wine bar Fallon & Byrne also offers wine at great prices; you can drink any of the 500 wines in the shop for a €10 corkage. “From the day we opened, we have been operating the €10 idea,” says manager Dave Gallagher. “It is great value if you trade up.” Certainly few restaurants can offer the delicious Dom Perignon on their list for €185 a bottle. Corkage drops to a mere €1 on Happy Mondays. The upstairs restaurant has a more expensive list, but customers can still avail of the €10 corkage from any bottle in the shop two floors below. Is it a coincidence that both Robson and Gallagher have a background in the wine trade? Certainly both have an unerring nose for great wine. Other good examples include Kelly’s Resort Hotel in Rosslare, Co Wexford with one of the best wine lists in the country at amazingly cheap prices and The Hole in the Wall on Blackhorse Avenue on Dublin’s northside where you can drink wines (and craft beers) from their shop at no extra cost. The Vintage Kitchen on Poolbeg Street in Dublin city centre does not charge any corkage at all. Just remember to drop into a decent wine shop on the way to dinner. I have no problem with restaurateurs making a profit. But I do think a decent bottle of wine is an important part of a good meal. I have mentioned just a few examples of restaurants taking a refreshing attitude to wine. I know here are many more. 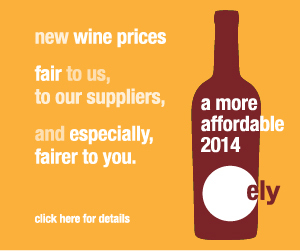 For our 15th year ely’s promise to you is a more affordable 2014. Enjoy the same excellent quality wines from winemakers, who share our passion, for less. We have restructured our margins and absorbed the last two duty increases, which has resulted in considerable reductions on the price of all wine across our entire wine list. Here are just a few examples from our list. It’s broken so let’s fix it. Since 1999 ely restaurants have paved the way for great wines by the glass as well as by the bottle. Expressive, engaging and rewarding wines, catering to all budgets. Today, in our 15th year, we are paving the way forward by completely rethinking how we price our wines. 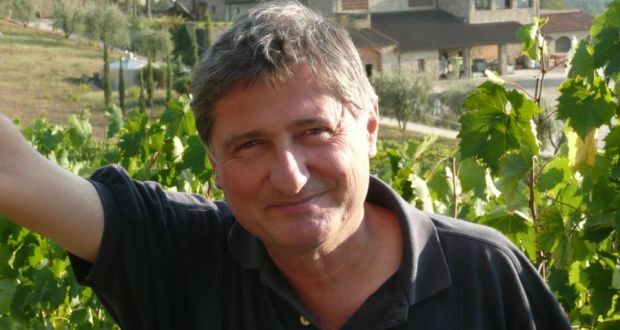 There have been considerable cost increases in Ireland pushing wine beyond acceptable price points in terms of the quality-value ratio: a global shortage in wine production, emerging markets in Asia, vineyards increasing prices, transport costs and the two duty hikes in the past twelve months. 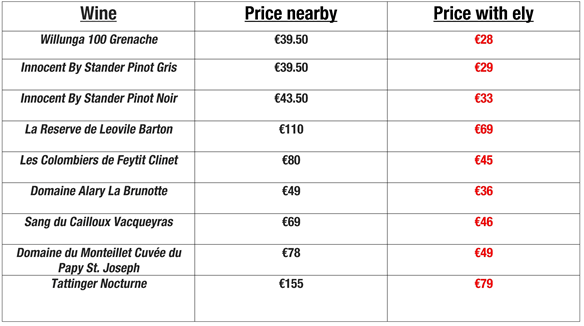 It’s worth noting that a particular Côtes du Rhône costing €4.25 wholesale in France costs €10.50 here, before the respective VAT rates of 19.6% and 23%. We don’t believe that margins should automatically follow increases in cost. With that in mind ely has absorbed the 2013 duty increase, has changed how it buys its wines and restructured its margins. These savings and an undying passion for seeing great wine enjoyed by our guests has resulted in considerable reductions in the price of wine in ely for 2014. We hope you’ll agree that our 2014 wine prices – for the same great wines from winemakers who share our passion and commitment to quality and our decade and a half commitment to food provenance – make ely wine bar, ely bar & brasserie and ely gastro bar great value when dining out in Ireland.